The damned condemning the damned. Good and bad alike feel the pressure as a child murderer terrorizes a German city in cinema’s first serial killer film. J. – This film also represents two small firsts for this blog: It is the first sound film we are going to cover, and it is the first film up for discussion that one of us had already seen before we took up the Sight & Sound Top 250 project. M is hands down one of my favorite movies. I’ve seen it many, many times, and was quite excited to have the chance to introduce it to you, S.
There’s a million things one could discuss about this film, but since we need to start somewhere, I think I’ll begin with the beginning. M does an amazing job establishing the mood of a city gripped by fear, and it presents the killer to the audience in a powerful way without really showing us anything. Lang gets so much mileage out of the killer’s compulsive whistling of “In the Hall of the Mountain King” and the fear of a worried mother, that all you need is a shadow, a ball rolling from the bushes, and a balloon caught in power lines to know that something truly ghastly has happened. Obviously the censors wouldn’t have allowed a film to depict a child being murdered, but Lang’s way is probably more powerful anyway. The viewer is left to generate his own vision of horror and is also placed in the same mindset of the citizens of the city: a mixture of revulsion and ignorance. The panic and suspicion of the populace become more real. S. – Setting the tone was done so skilfully. From the outset the threat is made clear and suddenly a sinister light is cast over the most ordinary of daily street scenes. Every interaction between a child and an adult is tainted with suspicion. Every moment a child is late home from school or play is fraught with tension. It is a very powerful demonstration of how the awareness of danger in our midst can smother peace of mind. So you watch and watch, hoping your alertness will avert disaster but it happens again anyway, right under your nose and no-one saw a thing. I agree with you, J., that it is by not furnishing the details that you are drawn in to the mindset of the citizens, you feel their powerlessness and fear. J. – Lang’s use of sound is quite interesting too. The killer is identified by his whistling, speakers are often heard but either not seen or placed with their backs to the camera (which would be unthinkable in a silent film). I’m not familiar enough with very early sound films to know whether Lang was being particularly innovative here, or if the novelty of sound meant that everyone was exploiting it as much as possible. Regardless, it is very effectively done. But back to setting the scene, I love that Lang does it visually as well as emotionally. The city always seems to be dark and empty; cops and crooks converse in rooms grimy with smoke; shadows are inky black and writ large on the screen. Everything becomes either grim and claustrophobic or grotesque and outsized. Perfect for the subject matter. S. – The disappearance of Elsie Beckmann, the first child to go missing during the film, signals the change to the deserted streets. A tipping point has been reached where people no longer feel safe with a killer at large. The police intensify their efforts and we are introduced to the complex and divergent characters of the killer Hans Beckert (Peter Lorre) and police Inspector Lohmann (Otto Wernicke). Amongst all the tension and grim subject matter the presence of the grizzled, overweight and highly competent detective is not just an important driver of the story but hugely entertaining to watch. His gruff manner brings some humour into the story without sacrificing gravity and most importantly gives us someone to cheer for. Basically Lohmann is awesome. J. – Lohmann is awesome, and I’m so glad we’ll get a chance to talk about him further in another entry. And his character brings up a couple of things I’ve always loved about M. First, the police’s reliance on actual policework. The movie details the evidence and the way the case against the killer is being investigated. It’s not a Holmesian genius or a loose-cannon man of action that miraculously intuits the case and races after the criminal, guns blazing. The cops gather evidence, sort it, argue and theorize, and basically work things out through tenacity and thorough investigation. And this goes double for the criminals, who are juxtaposed wonderfully to the police in the scene where Lang cuts back and forth between the smoky meeting rooms of the cops and the crooks as they each try to figure out how best to track down the killer. (Everyone in those scenes must have developed lung cancer by the end of filming.) The cops and the crooks are both competent, both thoughtful, and both vaguely menacing. It’s a fantastic setup. S. – I wouldn’t want to run into either those cops or the crooks in a dark alley! It is great to see both groups treated with respect for their smarts and their grit. The main difference is the cops take a more scientific approach to hunting down their man while the crooks, after emerging from their smoke-filled den, employ their networking skills to good effect. In both cases the pursuit is relentless. But the lynch-pin of the film is Peter Lorre, who has a harmless (if a little odd) quality that does not match with a monster that would prey on children. I felt he was convincingly able to convey a sense of horror at his own actions while still defending them as a part of his nature and therefore beyond his control. Somehow he manages to give weight to an ethical dilemma that you would expect to be washed away in the tidal wave of revulsion directed at a child killer. 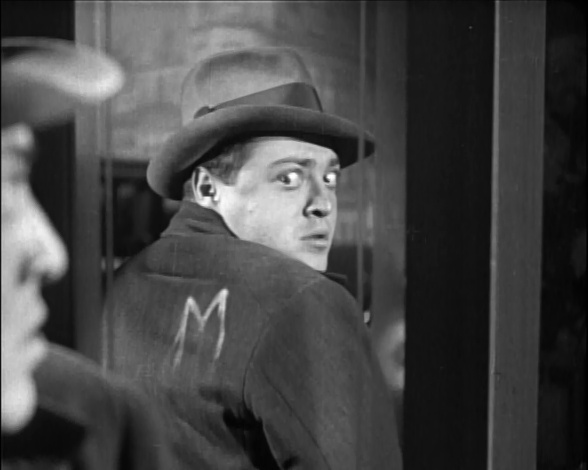 Peter Lorre plays the child killer Hans Beckert in his first starring role. The remarkable character actor discovers in this scene that he has been marked with an “M” for murderer (which lucky for English-speaking viewers is mörder in German). J. – Lorre gives a terrific performance as the baby-faced killer. He’s really required to play a whole host of characters in this film — from the kindly, smiling lurer of children; to a man who taunts the authorities; to a trapped rat; to a man who struggles violently to control the darkness inside. The scene when he breaks down and tries to explain his horrible compulsion is so hysterical, so over-the-top, but he completely sells it. It’s no wonder that he went on to be a star in Hollywood. (I mean, a cartoon version of him faced off against Bugs Bunny — that’s famous!) But I think you hit precisely on the amazing power of the performance (and of the film itself) by noting that you are forced to consider the killer’s dilemma. In a weird way you end up on Beckert’s side in the latter half of M, even though he’s by far the most detestable character in the film. S. – I enjoyed M immensely. From the emotive and tension-filled opening scenes, through the drama of the pursuit and the showdown of the criminal gang with the murderer, this movie always keeps you thinking. I can see why it is one of your all time favourites, J. I loved it too. And that creepy tune whistled by Lorre has to be one of the most unsettling touches I have experienced in any film yet. J. – I think M is a nearly perfect film. Sure, it has a few snippets that are holdovers from the silent age (but they tend to be pretty cool outdoor shots, so I forgive them) and the tacked on, moralizing coda is definitely not needed, but none of that really detracts from the grim, relentless power of the film. But given my longstanding admiration for the film, I am curious to see how I will rate M compared to the other movies we are going to discuss. I’ve watched M a lot, but most of the Top 250 are films I will be seeing for the first time. Can a single viewing of any film — no matter how great — top long-established pieces of my movie-watching repertoire like M and (another Peter Lorre gem) Casablanca? I fear that my “best of” list at the end of this experiment will look a lot like the list of films I already knew and loved. I’d like to think that I am more flexible than that, but I suppose only time will tell.